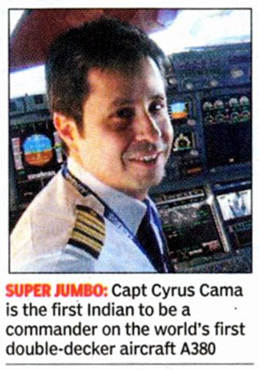 Capt Cyrus Cama becomes first Indian to commander the A380. MUMBAI: The world’s first double-decker aircraft A380 may not have had its maiden commercial flight in India, but it sure does have an Indian commander in its cockpit. 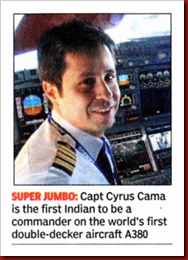 The super jumbo completed its first anniversary of commercial flying recently and a few months before that, Capt Cyrus Cama became the first Indian to be a commander on the A380. “I was expecting it,” said Capt Cama, in a telephonic interview, recalling his selection in Emirates’ first A380 training batch of eight pilots in May this year. “I feel very proud and happy about the whole thing. Being a Parsi and considering that a Parsi (JRD Tata) brought aviation into India, this achievement was of special significance to me,” says Capt Cama, who flies the 489-seater, Emirates A380 on the thirteen-and-a-half-hour Dubai-NewYork route. “It takes about 12 hours during the New York-Dubai leg,” he adds. So how was the A380 experience? “She flies very nicely and is very stable,” says the Capt. “You have to be aware of its sheer size. It’s wing span (wing tip to wing tip) is 79.8 m and it comes in the super category,” he says. In fact, the aircraft is so huge that airports have been redesigned to accommodate it. “Manoeuvring the aircraft on ground is the most demanding part. JFK airport in New York has dedicated taxi ways, parking stands for it,” he adds. Capt Cama, can easily be envied for having a supersonic career progression despite the cyclic nature of the airline industry. At 40 years of age and with 11,500 hours of flying experience, he is a line instructor on almost all wide-bodied and latest aircraft including the B777, A330, A340 and now the A380. A former Bandra resident, he was also the first Indian pilot to join Emirates and moved base to Dubai about 10 years ago. “Emirates has about 2,300 pilots and about 35-40 of these are Indians. Indian pilots were not recruited by foreign airlines when I joined the airline industry 19 years ago. In fact, even Air India did not hire fresh Commercial Pilot Licence holders,” he recalls. He was short of being 21 when he landed his first job with Vayudoot. He was with Jet Airways for five years before moving on to Emirates. But the A380 training was easily the most memorable one of his career. “I did my four-week ground and simulator training in Dubai and then went to Toulose for actual flying. More Indian pilots from Emirates will be flying the A380 in the coming months,” he adds. A total of nine A380 aircraft have been delivered to date, with six in operation with Singapore Airlines, one with Qantas and two with Emirates. According to manufacturer Airbus, more than 700,000 passengers have flown on A380 which now connects four continents and links Singapore with Sydney, London with Tokyo, Dubai with New York, and Sydney and Melbourne with Los Angeles. ← The Roots of a Name: What is Barack?